The Cloud Security Alliance Cloud Controls Matrix (CCM) is specifically designed to provide fundamental security principles to guide cloud vendors and to assist prospective cloud customers in assessing the overall security risk of a cloud provider. The CSA CCM provides a controls framework that gives detailed understanding of security concepts and principles that are aligned to the Cloud Security Alliance guidance in 13 domains. The foundations of the Cloud Security Alliance Controls Matrix rest on its customized relationship to other industry-accepted security standards, regulations, and controls frameworks such as the ISO 27001/27002, ISACA COBIT, PCI, NIST, Jericho Forum and NERC CIP and will augment or provide internal control direction for service organization control reports attestations provided by cloud providers. As a framework, the CSA CCM provides organizations with the needed structure, detail and clarity relating to information security tailored to the cloud industry. The CSA CCM strengthens existing information security control environments by emphasizing business information security control requirements, reduces and identifies consistent security threats and vulnerabilities in the cloud, provides standardized security and operational risk management, and seeks to normalize security expectations, cloud taxonomy and terminology, and security measures implemented in the cloud. 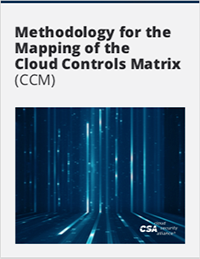 The CSA Cloud Control Matrix (CCM) Version 3.0, is a comprehensive update to the industry’s gold standard for assessing cloud centric information security risks. The CCM Version 3.0 expands its control domains to address changes in cloud security risks since the release of the CSA’s seminal guidance domain, “Security Guidance for Critical Areas of Focus in Cloud Computing version 3.0” while making strides towards closer harmonization of the two. Having drawn from industry-accepted security standards, regulations, and control frameworks such as ISO 27001/2, the European Union Agency for Network and Information Security (ENISA) Information Assurance Framework, ISACA’s Control Objectives for Information and Related Technology, the American Institute of CPAs Trust Service and Principals Payment Card Industry Data Security Standard, and the Federal Risk and Authorization Management Program, the updated CSA CCM control domain provides organizations with the cohesiveness of controls needed to manage cloud centric information security risks. This major restructuring of the CCM also captures the needs of cloud security governance in the near future, where it will serve as an annual check in updating future controls, further ensuring CCM remains in line with future technology and policy changes. Version 1.4 of the Cloud Controls Matrix includes two new mapping columns relating to AICPA’s SOC 2 engagement. The SOC 2 report provides cloud service organizations and cloud users more flexibility related to compliance and operational reporting controls. It addresses risk of IT-enabled systems and privacy programs beyond the controls necessary for financial reporting. The Federal Risk and Authorization Management Program (FedRAMP) is a US government-wide mandated program that provides a standardized approach to security assessment, authorization, and continuous monitoring for cloud products and services. This approach uses a “do once, use many times” framework that is intended to save cost, time, and staff required to conduct redundant agency security assessments. There are no “new” controls for FedRAMP. The FedRAMP security controls are based on NIST SP 800-53 R3 controls for low and moderate impact systems and contain controls and enhancements above the NIST baseline for low and moderate impact systems that address the unique elements of cloud computing. For additional information, refer to the FedRAMP FAQ website located at: http://www.gsa.gov/portal/category/102439. Shawn Harris has over 25 years of Information Security experience. He is currently the managing principal security architect at Starbucks Coffee Company. Shawn’s background includes engineering, architecture and executive responsibilities. His ability to understand how to transform an organization's goals into strategy and convince leadership of the critical nature of their decisions is what has driven his success. Having worked within several verticals (including the executive branch of the federal government, entertainment, retail, and financial services), Shawn’s insights and pragmatic approach to security allows him to provide an innovative approach that aligns with business priorities. Shawn previously assisted with the development of the CCSP (Certified Cloud Security Professional) certification, served on the NIST Cloud Computing Security working group, IETF JOSE working group, the Cloud Security Alliance CCM, CAIQ, and the Enterprise Architecture Working groups. He has contributed material for ISC2 CISSP, ISSAP, and CCSP examinations. Shawn is currently Co-Chair of a Cloud Security Alliance working group, leading efforts to develop the Cloud Control Matrix 4.0. Please contact Cloud Controls Matrix Working Group Leadership for more information.